After about three years in opposition, Japan’s conservative Liberal Democratic Party (LDP) won the national parliamentary elections on Sunday, paving the way for former Prime Minister 58-year-old Shinzo Abe’s return to power. LDP and allies won 325 seats in the 480-seat lower house. 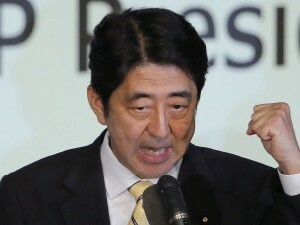 Abe, who is widely described as “hawkish” and “nationalist”, was Japan’s PM during 2006-2007. Prime Minister Yoshihiko Noda accepted the defeat of his Democratic Party of Japan (DPJ). Political observers hope this would bring political stability to the country. Abe would be Japan’s seventh Prime Minister in about six-and-a-half years. Observers had opined if Abe – who advocated ‘tough’ stance against China during election campaigns – came back to power, it would heighten Japan’s tensions with China over the disputed islands in the East China Sea. However, after the win, Abe announced that he would strive to improve relations with China, which is also Japan’s largest trading partner. He also said that he would bring the faltering economy back on track by passing a stimulus package. LDP comes to power at a time when Japan faces deep problems ranging from a swelling national debt, a widening trade deficit and an ageing population. A special parliamentary session would be held before year-end to pick a new Prime Minister, which is just a formality as Abe is almost certain to be appointed the premier.